Premiering: Monday, May 25th at 8 p.m. (central) and continuing on Tuesday, May 26th and June 1, 8 and 15 at the same time. Remember the Alamo and its aftermath. Just not in this way. But let’s first faintly praise the History network’s Texas Rising, a five-part, 10-hour “event series” premiering on Memorial Day. It has an authentically gritty, unscrubbed look, convincingly transporting viewers to its time and place in the manner of History’s hit miniseries Hatfields & McCoys and hit series Vikings. Texas Rising also executes its action scenes with dexterity while making numerous corpses look thoroughly dead and worse for wear. Let’s not forget, though. This is the network that several years ago spent $25 million on The Kennedys before abruptly rejecting the star-studded miniseries as “not a fit for our brand” and of questionable historical accuracy. More to the point, it didn’t sufficiently varnish the Kennedy legacy, failing a political correctness test with flying colors even though revealing nothing about the clan that hadn’t already been dramatized. The Kennedys instead wound up on the still obscure ReelzChannel, eventually receiving 10 Emmy nominations and winning four statues. “1836. Texas is in flames. “This disputed Mexican territory is now home to tens of thousands of U.S. settlers. Comanches and Karankawas fight to hold their native lands. Slaves, brought from the Americas, caught in the crossfire. “Texians boldly declare an independent Republic, but Mexico’s dictator General Santa Anna is determined to destroy all resistance. U.S. President Andrew Jackson, forbidden by treaty to intervene, places his hope that Texas will rise and join the Union, becoming the pathway to the Pacific Ocean. Outnumbered by a Mexican army of thousands, Gen. Sam Houston’s rag tag volunteer army and a fierce militia known as Stephan Austin’s Ranging company -- are all that stand between freedom and oblivion. The Alamo was reduced to ashes. Settlers. Mexicans. Tejanos. Indians. Renegades. Soldiers. All were left with no choice. Get the gist? Or perhaps you’ll get the munchies before the end of this 140-word opus. Yes, that easily whips the original 93-word introduction to Star Wars. I checked, I counted, you’re welcome. Emily actually existed but there’s absolutely no documentation that she was ever at the Alamo. Nonetheless she’s depicted at the start of Texas Rising as a survivor of the famed assault who then watches her brother and others executed at the order of Santa Anna. Emily eventually works her way into Santa Anna’s camp after first sleeping with Sam Houston, who earlier had bedded her back in New Orleans. “I want a warm bath -- with you in it,” she tells the dictatorial, mercurial Mexican general. And so she shall have it before mounting Santa Anna in his personal tub as part of her grand plan to win his favor while also spying on him. Um, that’s pure fiction in terms of any relationship with Houston. But Emily in fact was kidnapped by Santa Anna’s forces, according to some accounts. Texas Rising takes it from there. The drama’s most compelling character, at least in the first four hours made available for review, is Houston loyalist “Deaf” Smith (Jeffrey Dean Morgan), a kindly tough guy whose wife, Lupe, is Mexican. Their recurring scenes together have a natural feel in a drama that walks a tightrope between portraying Santa Anna as a wanton madman while other Mexicans, including his second-in-command, are sympathetic or noble. Paxton’s Houston is a vexed leader whose men repeatedly see him as a chicken-hearted commander who’d rather retreat and bide his time than engage the enemy. “I’m not gonna sacrifice what little Army I have by charging pell-mell into Mexican lances,” he says rather floridly. For semi-comic relief, Texas Rising offers the weaselly Sgt. Ephraim Knowles (Jeremy Davies), a recaptured deserter who sounds a lot and looks a lot like Will Forte’s hapless Phil Miller in Fox’s The Last Man Rising. Viewed through that prism, he’s a riot. Kristofferson pops in very briefly in Chapter Two as President Andrew Jackson, who with all due solemnity cites Houston’s previous demonstrations of bravery as a reason to keep him in command. Altogether, he’s on screen for less time than the printed prologue -- at least through the first four hours. 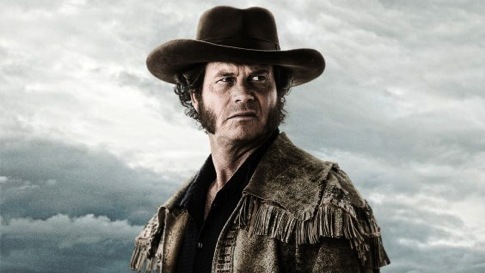 Texas Rising originally was announced as an eight-hour miniseries. And in Chapter Two, the plodding and dragging are very much in evidence. Houston, for one, leads an extremely leisurely journey -- with a handful of men -- to warn the Texians at Goliad of an impending all-out Mexican army attack. Their horses move at a gait that’s perhaps one-quarter as fast as the steeds on a merry-go-round. Some of the dialogue, whether mouthed by actual or made-up characters, is a seemingly unintended hoot ’n’ a holler. “You’re so pekid you look like death eatin’ a cracker,” Houston is told by his doctor.